Who is responsible for the Quetta hospital bombing that killed 70 lawyers in Pakistan? Can the Pakistani security establishment get away by blaming RAW for the attacks? Who is ultimately responsible for the security of the Pakistani citizens? Are the culprits of terror attacks in Pakistan entirely homegrown? Who funded them? Is the Pakistani security establishment serious in fighting the Taliban? Is there foreign involvement? Are Indian and Afghan intelligence agencies involved? Should the Pakistani citizens now talk directly talk to the foreign intelligence agencies and ask the foreign hand for mercy? What has Indian NSA Ajit Doval said about using the Taliban to wage proxy war against Pakistan? Should the Pakistan Army let things happen the way Doval wanted things to happen? What have American officials and analysts been saying about India's role in Pakistan terror? Should Pakistanis use this as an excuse for the ongoing terrorist attacks? What did Indian agent Kulbhushan Yadav tell the Pakistani authorities? Does that statement prove the might of the Indian intelligence agencies and the impotence of the Pakistanis? What can and must Pakistan do to end this reign of terror? Is it true that all terrorists are Muslims, especially in the last two years? What do the official statistics say about Muslims' involvement in terrorist attacks in Europe and America? Are those statistics valid for the last two years? Why do the older official stats differ so much from the news media reporting of acts of terror in the West, in the recent past? Is there disproportionate media coverage of terror acts involving Muslim perpetrators? India's Role in Quetta Bombing; Official 'Muslim Terror' Stats from Ikolachi on Vimeo. Ajit Doval Lecture on "How to Tackle Pakistan"
Talk is not evidence. Talk needs to be backed up by physical evidence and a trail that leads to the offender. Let me tell you Pakistanis have complained at the highest levels but it never gets followed up with irrefutable evidence. Jon: " Talk needs to be backed up by physical evidence and a trail that leads to the offender." It seems you don't understand the basic difference between ordinary crime-fighting and dealing with state-sponsored terrorist actions like the ones in Quetta and other parts of Pakistan. The US experience shows that even organized crime like Mafias could not be fought with ordinary tools and criminal prosecutions. They had to enact racketeering laws to change the rules of evidence and make it easy to convict gangsters and to break up criminal gangs. Dealing with state-sponsored terror is much more difficult than organized crime. You can convict a few individuals who pull the trigger but you can not get the masterminds without disrupting the intelligence operations sponsoring and supporting major acts of terror. The US enacted Patriot Act to make it easy to convict a few terror suspects but they still had to go beyond it and create military tribunals at Guantanamo and still could not convict most of the suspects. Operating on the Chanakyan dictum of “repeating a lie so often that it appears to be the truth”, Afghanistan has been alleging that Pakistan has been ruining Afghanistan. The time has come to break this myth and set the record straight. Pakistani tribal Pashtun journalist Shah Zalmay Khan’s three recent Op-Eds titled: ‘Pakistan Ruined Afghanistan? Myths and Facts’, ‘Pushtoonistan: Myths & Facts’ and ‘Durand Line: Myths & Facts’ help shatter the shibboleth and myths being spread by Afghanistan for over decades. Let us take the allegations one by one. The first is Pakistan interfering in Afghanistan. History proves it to be the other way around. Pakistan was founded on August 14, 1947 having fractured institutions, almost no economy, weak military and apparently bleak future, fighting for survival in the face of a giant hostile neighbour like India at its throat. Afghanistan became the only country to vote against Pakistan’s membership of United Nations. Simultaneously, Pashtunistan flag was raised alongside Afghan national flag in Kabul, while Afghanistan started arming and funding proxies in the border areas (e.g. Afridi Sarishtas and Ipi Faqir) for the ‘Liberation of Pashtunistan’. This led to skirmishes between Pakistani forces and Afghan proxies. In June 1949, while pursuing miscreants who attacked Pakistani border posts from Afghanistan, a PAF warplane inadvertently bombed the Afghan village of Moghulgai on the Waziristan border. In July 1949, a Loya Jirga was held by Afghan government at Kabul unilaterally denounced all treaties related to Pak-Afghan international border and announced full support for Pashtunistan. August 31 was declared as ‘Pashtunistan Day’ which was regularly commemorated by Afghan government every year. Between 1948 and 1949, Afghan-supported proxies announced the formation of ‘Pashtunistan’ in Tirah (Khyber) and Razmak (Waziristan), with Faqir of Ipi as President. Between September and October 1950, Afghan army with artillery support attacked Dobandi area of Balochistan and occupied a strategic pass with the aim to cut off Chaman-Quetta Railway link. Pakistani army rushed reinforcements to the area and retook the pass after a week’s fighting. On October 16, 1951, Pakistani PM Liaquat Ali Khan was shot dead in Rawalpindi by an Afghan national Said Akbar Babrak. Afghan government disowned his act but its propaganda and support for separatists continued unabated. On March 30, 1955, Pakistan’s diplomatic missions in Kabul, Qandahar, and Jalalabad were attacked at the behest of Afghan government and Pashtunistan flag was hoisted on the chancery of Pakistan Embassy in Kabul. In September 1960, Afghan army troops and militias attacked Bajaur. The attack was repulsed by Bajauri tribesmen with help of SSG forces from Cherat. An account of the battle is found in a declassified US Embassy document number D-92 of January 25, 1961 from its Consul at Peshawar. Afghanistan supplied arms and ammunition to proxies led by Pacha Gul in Bajaur’s Batmalai area for an uprising. The ammunition dump was destroyed by PAF aerial bombing in March 1961. In May 1961, thousands of Afghan troops disguised as militias attacked Bajaur, Jandul and Khyber. The attacks were repulsed by tribesmen with support of Frontier Corps and aerial bombing by PAF warplanes. President Ayub warned the Afghan side against unprovoked escalations. On September 6, 1961, diplomatic relations between Pakistan and Afghanistan were cut off after Pakistan decided to restrict Afghan transit trade due to its continuous support for Pashtunistan proxies. The relations were resumed two years later, in 1963, when Sardar Daud (the main engine behind Pashtunistan) resigned as Prime Minister. Ye sub information need to be shared. Humne ye information ko kya kiya?? "Ye sub information need to be shared. Humne ye information ko kya kiya??" The information has been shared multiple times via diplomatic channels but, no country finds Pakistan's claim credible that there is state sponsored terrorism from India. On the contrary, UN has listed many home grown and some of which are state or ISI sponsored terrorists groups. Kanaiya: "no country finds Pakistan's claim credible that there is state sponsored terrorism from India. " Who do you think is Chuck Hagel? Is he not US Senate Intelligence committee member and later Defense Secretary? What did he say about it? "India has always used Afghanistan as a second front against Pakistan. India has over the years been financing problems in Pakistan". On what basis did Chuck Hagel make the statement about India's use of Afghan territory to attack Pakistan? Was he, too, just another victim of conspiracy theories? Off course not. Secretary Hagel had the benefit of intelligence briefings by the CIA given to him in multiple capacities: first as US Senate Intelligence committee member and then as US Defense Secretary. Since Mr. Hagel made his statement, there has been further evidence of India's involvement in Balochistan with the recent arrest of Kulbhushan Yadv, a serving Indian Navy officer working under cover in Balochistan. Yadav has confessed to working with terrorists launching attacks in Pakistan. US analyst Laura Rozen explained India-Taliban nexus as follows: "While the U.S. media has frequently reported on Pakistani ties to jihadi elements launching attacks in Afghanistan, it has less often mentioned that India supports insurgent forces attacking Pakistan, the former (US) intelligence official said. "The Indians are up to their necks in supporting the Taliban against the Pakistani government in Afghanistan and Pakistan," the former (US) intelligence official who served in both countries said. "The same anti-Pakistani forces in Afghanistan also shooting at American soldiers are getting support from India. India should close its diplomatic establishments in Afghanistan and get the Christ out of there." The biggest indictment of India's sponsorship of terrorism in Pakistan is documented as Indian RAW's "success" by ex Intelligence officer RK Yadav in his book "Mission R&AW"
In a significant shift in policy on Pakistan, Prime Minister Narendra Modi made a reference to the Baloch freedom struggle in his Independence Day speech, saying the people in the conflicted Pakistani state of Balochistan, as also in Gilgit and Pakistan-occupied Kashmir, had reached out to him. Pakistan responded by saying the statement “confirmed” India’s role there. “Today from the ramparts of Red Fort, I want to greet and express my thanks to some people. In the last few days, people of Balochistan, Gilgit, Pakistan-occupied Kashmir have thanked me, have expressed gratitude, and expressed good wishes for me. The people who are living far away, whom I have never seen, never met — such people have expressed appreciation for Prime Minister of India, for 125 crore countrymen,” Mr. Modi said. The reference comes a few days after the Prime Minister vowed to take up atrocities by the Pakistani government in these three areas on the international stage, when he spoke to an all-party delegation about the situation in Jammu and Kashmir. Since then, government officials say Mr. Modi had received many messages on social media from Baloch groups and Kashmiris around the world and in Pakistan thanking him for his support. Repeating the charge against Pakistan on its support to terror groups in Kashmir, Mr. Modi accused the Pakistan government of glorifying terrorists, saying the Sharif government’s actions came in sharp contrast to India’s empathy with Pakistanis over terror attacks there, as after the Peshawar school massacre of 2014. “On the other side, terrorism is being glorified. When innocent people are killed in terrorist attacks, there are celebrations. How governments are formed through inspiration of terrorism. The world will understand this difference clearly,” he said. Within hours, Pakistan’s government responded to the Prime Minister’s comments on Balochistan. “PM Modi’s reference to Balochistan, which is an integral part of Pakistan, only proves Pakistan’s contention that India through intelligence agency RAW has been fomenting terrorism in Balochistan,” Foreign Affairs Adviser Sartaj Aziz said on Monday. India stands behind to support the freedom of Baloch and their country of balochistan. What explains #Modi government kicking up a row over #China #Pakistan Economic Corridor (#CPEC) now? The big question is: How do the Chinese assess the Modi government’s proclivity to count the trees instead of seeing the woods? Do they sense this might be a matter of conscious choice? What rankles most in the Indian mind is China’s relations with Pakistan. The Modi government demands that China should suspend the China-Pakistan Economic Corridor on the plea that Gilgit, Baltistan and Pakistan-Occupied Kashmir are Indian territories. In reality, though, we have a classic situation where it is entirely up to India to raise dust (or not to raise dust). It is even baffling how economic development of those neglected regions would hurt Indian interests. After all, the people inhabiting those regions are also Indians, isn’t it? The sensible thing would have been to let the Chinese loosen their purse strings to develop our territories that happen to be inside Pakistan temporarily so that when we finally make them part of Akhand Bharat, they won’t be the impoverished terrorist-infested swathes of land that they are today. Frankly, India is taking an illogical stance. The Modi government estimates that Economic Corridor is “India-centric”, whereas, it is a strategic initiative by China in self-interest. China has a good reputation for putting money only where the mouth is – and $46 billion is a lot of money. The Chinese motivations are not difficult to comprehend. The Economic Corridor boils down to project exports by Chinese industry, which is saddled with excess capacity. Two it opens up efficient communication links with markets in the Gulf and Africa. It fuels the economy of Xinjiang. It mitigates to some extent China’s “Malacca Dilemma” – the fact that 80% of China’s oil imports have to pass through the strait en-route from West Asia and Angola. It creates leverage to balance the traditional American dominance over Pakistan. Indeed, finally, it cannot be overlooked that One Belt One Road Initiative has a geopolitical dimension insofar as it counters the US’ strategy to encircle China and "contain" it. Conceivably, the China-Pakistan Economic Corridor will galvanise Pakistan’s economy. Now, isn’t that a nice thing to happen if it prods our western neighbour to understand that getting rich is the smart thing to do? If China succeeds in transforming Pakistan as a modern middle-income economy like Turkey or Malaysia, it can only strengthen regional security. But then, a paradox arises: If Pakistan does not collapse as a “failing state” and instead becomes a more prosperous country than India, what happens to Akhand Bharat? The smart thing would have been to offer to the Chinese an economic corridor through our territory. It is advantageous to be a transit country. "If China succeeds in transforming Pakistan as a modern middle-income economy like Turkey or Malaysia, it can only strengthen regional security. But then, a paradox arises: If Pakistan does not collapse as a “failing state” and instead becomes a more prosperous country than India, what happens to Akhand Bharat? LOL. This is like the proverbial rats deluding that they will bell the cat. China has eaten resources of African and Latin American countries without making one difference in their prosperity. Pakistan will be no different. China has never been in nation building (unlike USA). Plus 3rd rate education in Pak. Ramesh: "Plus 3rd rate education in Pak. " 1. Indian kinds perform at the bottom of the rankings for international standardized tests like PISA and TIMSS. 2. Pakistani kids outperform Indian kids according to ASER assessment tests. 3. Over 80% of Indian engineering grads are unemployable, according to Aspiring Minds, an Indian employability assessment firm that did a a study of 150,000 engineering students at 650 engineering colleges in the country. In 1985 I was posted in New Delhi for a news agency. When I use to travel to Pakistan, the country without a doubt looked better and the per capita income affirmed that. Pakistan was 65% higher than India. In terms of literacy India was ahead but economically Pakistan appeared better. After 30 years, Pakistan appears stagnant and India now seem to gallop away. Per capita of India is now almost 30% higher and the gap, I assume, will widen. Margie: "economically Pakistan appeared better....After 30 years, Pakistan appears stagnant and India now seem to gallop away. Per capita of India is now almost 30% higher and the gap, I assume, will widen"
Pakistan still looks better to people who have recently traveled to both nations. They found Pakistan is more developed, cleaner and better organized than India. As to the reported per capita incomes, the fact is that the median income in Pakistan is much higher than India. As a result, Pakistan has a larger and richer middle class than India, according to a recent Credit Suisse wealth report. Average ($4,459) and median ($2,216) wealth figures for Pakistani middle class adults are higher than average ($4,352) and median ($868) wealth figures for their Indian middle class counterparts. It's a consequence of lower income wealth inequality in Pakistan compared to its neighbor. For comparison, only 1.1% of Bangladesh adult population qualify as middle class. Their average wealth is $2,201 and median wealth $1,102 per adult. From the sandstone walls of the 17th-century Red Fort in India's capital, Prime Minister Narendra Modi sent a warning shot this week to his counterparts in Islamabad and Beijing. Modi's reference to disputed territories on Monday during his annual Independence Day speech -- his most high-profile appearance of the year -- signaled that India would become more aggressive in asserting its claims to Pakistan-controlled areas of Kashmir. The region is a key transit point in the $45 billion China-Pakistan Economic Corridor known as CPEC that will give Beijing access to the Arabian Sea through the port of Gwadar. "This is a recalibration" after Modi's overtures to Pakistan and China failed to yield results, says Harsh V. Pant, a professor of international relations at King's College London. It's also a message to China: "You may be investing a lot in Pakistan, and think that CPEC is a done deal, but without India's approval you might find it difficult to follow through." A more vocal India threatens to raise tensions in a region rife with deep-seated historical animosity that has made South Asia one of the world's least economically interconnected regions. Various insurgents and militant groups threaten both China's investments in Pakistan and progress in India-controlled Kashmir, where recent violence has killed about 60 people. While India is more likely to redouble efforts on developing transport links with Iran and Afghanistan than sabotage China-Pakistan projects, the saber-rattling may deal a setback to investor confidence in the region, according to Michael Kugelman, senior associate at the Woodrow Wilson Center in Washington. "The bottom line is that in a volatile region like South Asia, you don't need actual aggressive actions to cause economic consequences," he said. "Mere threats can have a very real effect on the economic state of play as well." In a bold rhetorical move on Monday, Modi overtly referred to the region of Balochistan, a resource-rich, insurgency-riven Pakistani province that is home to the strategic deep-water port of Gwadar. He also mentioned Gilgit, a Pakistan-administered region that borders China and Afghanistan -- the northernmost edge of the planned economic corridor. "I want to express my gratitude to some people -- the people of Balochistan, Gilgit and Pakistan-occupied Kashmir -- for the way they whole-heartedly thanked me, the way they expressed gratitude to me, the way they conveyed their goodwill to me recently," Modi said in his speech. The mention of Balochistan was particularly provocative. Pakistan has long accused India of backing rebels in the region, a charge governments in New Delhi routinely denied even while they blamed Pakistan for backing militants in Kashmir. While Pakistan condemns Indian security forces in Kashmir, human rights groups have expressed concern about disappearances and extrajudicial killings in Balochistan by Pakistan's military, intelligence and paramilitary forces. Modi's comments prove Pakistan's contention that Indian intelligence agencies are "fomenting terrorism in Balochistan," Pakistan's foreign ministry said in a statement on Monday. It also said the remarks were meant to divert attention from protests in the Indian state of Jammu and Kashmir, where dozens of protesters have been killed in the past month. The centre has not sincerely pursued a policy of dialogue with the exiled Baloch leadership, except for former Balochistan Chief Minister Dr Abdul Malik Baloch who made some efforts to reach out to Europe-based exiled Baloch leaders such as Khan of Kalat and Brahamdagh Bugti. Bugti surprisingly demonstrated willingness to negotiate with the government. Islamabad did not trust his commitment because the Baloch leader simultaneously kept on seeking international support for the Baloch independence movement in his interviews, which meant that he had not fully withdrawn from his demand for a free Balochistan. One understands the military's disillusionment with the slipping state of affairs in Balochistan where insurgents keep frequently attacking official installations and killing security forces. The Frontier Corps once again forced students and teachers to celebrate this year’s Independence Day. Instead of healing the Baloch people's wounds, the establishment has promoted a dangerous wave of hyper Pakistani nationalism. Hence, people like Home Minister Sarfaraz Bugti spend most of their time questioning other people’s patriotism and resort to bizarre ways to prove themselves as better Pakistanis than the rest. Basically, this is a flawed strategy to produce patriotic citizens. MORE and more Pakistanis have come to believe that they live in a hostile and conspiratorial world with shadowy enemies all around bent on the country’s destruction. The suicide bombing which shredded almost a full generation of Baloch lawyers in a Quetta hospital was instantly declared the work of India’s spy agency RAW by Balochistan’s Chief Minister, Sanaullah Zehri. No proof was offered that a foreign hand was responsible for this grisly act of terror. Nor did the ISPR spokesperson present evidence of what he alleged — that the attack had actually targeted the China-Pakistan Economic Corridor project. Sadly, it is not just the government and military which presents conclusions without evidence, and which allows personal or institutional interests to override good judgment. A paranoid style has come to dominate politics in Pakistan. All you have to do is turn on the TV and watch political talk shows where anchors and guests compete for the highest levels of heated exaggeration, suspiciousness, and conspiratorial fantasy. Even Pakistan’s intelligentsia has sometimes used paranoia to further its self-interest. I can bear personal witness to one such situation involving almost the entire faculty of Quaid-i-Azam University. Jawaid E: "Excellent piece by Pevez Hoodbhoy in Dawn"
When Pakistan accused Wali Khan of working for RAW, people like Hoodbhoy called it a conspiracy theory.
" Wali Khan (son of Abdul Ghaffar Khan aka Bacha Khan) wanted moral, political and other support from Mrs. Indira Gandhi. R.N. Kao sent his deputy Sankaran Nair to negotiate as the Indian representative. Since Pakistan embassy was keeping watch on the movements of Wali Khan, the rendezvous was shifted to Sweden where Nair and another R&AW man of Indian mission I.S. Hassanwalia met Wali Khan. Subsequently all sorts of support was given to Wali Khan by the Indian Government till 1977 when Indira Gandhi lost election". Similarly, Agartala Conspiracy charge was dismissed by many in Pakistan as just another "conspiracy theory". "In view of the disclosures of S.K. Nair, it is evidently true that Mujib was implicated in the Agartala Conspiracy case at the instance of Pakistan Government. However, it is also true that other accused in this case were certainly agents of Intelligence Bureau (IB) in India"
Is Terrorism Getting Worse? In the West, Yes. In the World, No. If it feels as if terrorism deaths are rising in the West, it’s because they are. 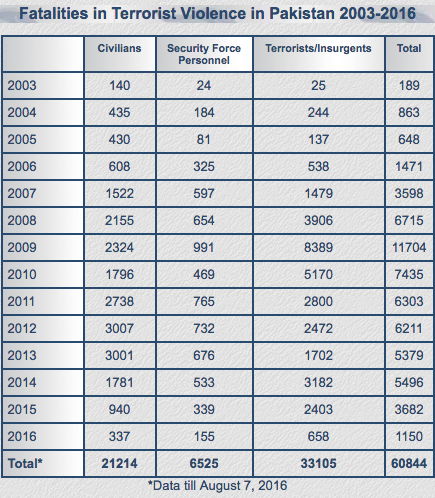 Yet the numbers remain relatively small, and globally, deaths from terrorism appear to be declining, not rising. According to two big databases, the number of people who died in terror attacks in North America and Western Europe rose markedly in 2015, claiming more than 200 lives. This year, according to one count, it is on track to be even worse. But terrorism in the West is rare. In the parts of the world where it is more common — deaths in those regions are in the thousands rather than the dozens — terror attacks appear to be decreasing. And as bad as terrorism has been in the West recently, it was worse in the 1970s and 1980s. High-profile attacks in cities that include Brussels; Paris; Orlando, Fla.; and San Bernardino, Calif., have fed public fears of terrorism in the United States and made it a big issue in the presidential campaign. President Obama, Hillary Clinton and Donald J. Trump have all highlighted the risk of terrorism at home. Analysts who monitor terror attacks around the world note that risk perception doesn’t always correspond to actual risk. The groups committing acts of terrorism over time have changed, of course. But data from the Global Terrorism Database at the University of Maryland, which has cataloged terrorist attacks since 1970, shows last year’s terrorism death toll would have been fairly typical for an earlier era. The death toll from terrorism increased in the West last year, with large attacks in San Bernardino, Calif., and Paris. But terrorism was more deadly in decades past. Slumdog India got 2 medals in Plympics. Shining Pakiland which is getting upgraded by Moodys and MSCI has come back emptyhanded 7th time in a row. prof Riazul Haq sb, jawaab do! Jawaab do!!! Jawaab do!!! Majumdar: "prof Riazul Haq sb, jawaab do! Jawaab do!!! Jawaab do!!!" It's a sad story. I don't see it getting any better anytime soon. Good! Our tax rupees are being put to some good use. A+++++++ Agency, will invest more! Riaz Haq Sahib, you do not have to publish this comment. I find myself agreeing with your analysis at least 99% , if not 100% of the time. I also find myself disagreeing with Mr. Cemendtaur's analysis the majority of the time. However, one thing I do admire about him is his ability to patiently sit and wait his turn and maintain his cool during the discussion regardless of how controversial the discussion is. I know he makes very outrageous and illogical statements at times (actually quite frequently), but I find that you lose your patience very quickly, and start interrupting, which raises the temperature of the discussion, and makes it less professional. My suggestion is to distract yourself with taking notes while he's talking, and then address calmly each of his points when he's done. I think that will make your points much more impactful. Riaz Haq, I find it insulting that you keep comparing Pakistan with the country that has given us Caste system and sutti. Who's only contribution to science is the invention of zero. Time for Pakistan to start thinking big and get out of this competition with a third rate country. QUIETLY, AMID the carnage and chaos in the daily news, 2016 is shaping up as a good year for peace in the world. You read that right. A significant escalation of war over the past few years is, at the moment, abating. For nearly two-thirds of a century, from 1945 to 2011, war had been in overall decline. The global death rate had fallen from 22 per 100,000 people to 0.3. But then the Syrian civil war became the bloodiest conflict in a generation, with hundreds of thousands killed, millions displaced, and multiple foreign powers joining the fight or supporting their proxies. The UN Security Council deadlocked on what to do about it, and eventually ISIS carved out a territory and enlarged it into Iraq and beyond. New wars cropped up elsewhere. The world’s youngest country, South Sudan, fell into grotesque tribal violence. Nigeria lost territory to Boko Haram, with its penchant for kidnapping girls and other ways of brutalizing civilians. A Christian-Muslim divide in the Central African Republic devolved into a horrific civil war. Russia grabbed Crimea from Ukraine in flagrant violation of international law. An inept Saudi bombing campaign has devastated Yemen, while Libya has split into pieces controlled by armed groups including ISIS. To top it off, in several countries, Islamist militants carry out spectacles of bombing and shooting. By 2014 (the most recent year with complete data), the death rate had climbed to 1.4 per 100,000 — still far lower than in the Cold War years, but a troubling U-turn from the world’s peaceward course. Because most of these wars have not yet ended, and because lurid terrorism continues in many parts of the world, almost nobody has noticed a happy development that wafted in during the first quarter of 2016: The level of war violence has fallen markedly. The big event is the partial cease-fire in Syria, which has now lasted for six weeks. Fighting with ISIS and the Nusra Front continues, and violations recur, but much of the country is breathing a sigh of relief, and humanitarian access has expanded substantially. Of course the point being missed is the number of thwarted terrorist attacks! Catskill: " Of course the point being missed is the number of thwarted terrorist attacks!" Vast majority of these "thwarted terrorist attacks" are manufactured by FBI and its informants. Stephen Downs, an attorney and founding member of Project Salam , which gives legal support to Muslims, told Business Insider that " the government has developed a technique of engaging targets in conversations of a somewhat provocative nature, and then trying to pick up on things the target says, which might suggest illegal activity — and then trying to push them into pursuing those particular activities." Both are right about thwarting terrorism and entrapment. From the Shoe bomber to Time Square bomber many terrorist attacks were thwarted and casualties were prevented. Entrapment was also carried out but it is conjecture how terrorist attacks were prevented. However, the low number (19) in itself is a sign that such attacks didn't cause high number of deaths. I hope Mr. Riaz Haq post my this comment for factual correction of this guy. G. Ali: "Who's only contribution to science is the invention of zero." Ranked 13th at global research (above Russia's 19th). I don't need to mention about Indian space program, R&D nearly equal to total Indian Defense Budget($50 billions), making INO- Indian counterpart of CERN (with four times bigger magnet than CERN) or innovating much more, like trials of world's first leprosy vaccine recently. No offense intended, but put your facts right. Public broadcaster All India Radio (AIR) is planning to focus on its news service in Baluchi language, a move which comes days after Prime Minister Narendra Modi flagged concerns about the condition of people in Balochistan in Pakistan. "The All India Radio (AIR) already has a service in Baluchi language which air .. The terrorist attack on the Indian Army base camp at Uri in the early hours of Sunday gives a sickening feeling that the asymmetric war with Pakistan, which began tapering off a year ago, is restarting. (here) What has happened to our Pakistan policy? There are always ‘red lines’ in diplomacy and the most important ones are always the self-imposed ones. I can ‘declassify’ a vital information, namely, that in the a priori history before Prime Minister Narendra Modi came to power in May 2014, we took care not to violate the ‘red lines’ – crying hoarse over Pakistan-Occupied Kashmir and Gilgit-Baltistan or hobnobbing with Baluchi secessionists. The present government has breached those ‘red lines’. The National Security Advisor in the government Ajit Doval openly threatened to ‘do another Bangladesh’ to Pakistan by splitting Baluchistan province. PM has now tacitly acknowledged that that threat is actually his government’s policy. The PM’s admirers are cheering wildly. They are thrilled he is taking a leaf out of Chanakya to put Pakistan in its place – ‘Samam, Danam, Bhedam, Dandam’, et al. They are speculating in the social network sites where our training camps for Baluchi rebels could be located. Some say Jaisalmer in Rajasthan, bordering Sindh, is ideal. Whoever advised PM to ride the Baluchi tiger must be a moron of the first order. Make no mistake, the attack on Uri army base is an act of retaliation from across the border. I wrote only two days ago that Americans could be in possession of intelligence regarding likelihood of a terrorist strike. (See my blog Washington’s Modi blues.) There are obviously grey areas that need explaining by the government. Couldn’t the security establishment anticipate that a Pakistani retaliation was inevitable? The public opinion should comprehend how dangerous is this shift in our country’s policies. The Indian policy consistently factored in that a realistic solution to the Kashmir problem would somehow devolve upon international recognition to the Line of Control. Not even mavericks thought it was within the realm of possibility to annex POK. Equally, we knew that even if public sentiments in POK turned critical of Islamabad, that didn’t mean tilt favouring integration with India. As for Gilgit and Baltistan, chances of annexing those remote regions are simply non-existent. Nonetheless, we did invoke POK now and then – never Gilgit and Baltistan, though – whenever we needed to nail Pakistani propaganda. Period. However, government legitimised our propagandistic stance as India’s official policy. And it took a great leap into the dark by making Baluchi nationalism the stuff of our prime ministerial diplomacy. Had PM ever visited Pakistan, even once, he’d have known how deeply scarred that country’s psyche is even today, after four decades, that India cut open its womb once and took away one half. No matter the sound rationale of our ‘humanitarian intervention’ in East Pakistan, the fact of the matter is that no country ever did such a thing to a neighbouring country in all of modern history. Yet, the ruling elites are strongly signalling that India planned to team up with Afghanistan to dismember Pakistan. The Indian Express newspaper commented editorially that Afghan President Ashraf Ghani’s recent visit to Delhi marked the launch of an interventionist policy similar to the saga in Sri Lanka in the eighties. (here) The Uri attack came 5 days after Ghani’s visit. "There's no question there's communication between the ISI and various militant groups in FATA and Balochistan (Haqqanis, Taliban, Islamic Movement of Uzbekistan, etc) but some of it you'd do anyway as an intelligence service.....there may be some degree of accommodation that is forced on them (Pakistanis) because of the limits of their (Pakistan's) forces.... I looked very very hard then (as US commander in Afghanistan) and again CIA director at the nature of the relationship between the various (militant) groups in FATA and Baluchistan and the Pakistan Army and the ISI and I was never convinced of what certain journalists have alleged (about ISI support of militant groups in FATA).... I have talked to them (journalists) asked them what their sources are and I have not been able to come to grips with that based on what I know from these different positions". Some people say Pakistan is a frenemy...it is just very very difficult to pin down (blame on Pakistan) and it's even more difficult to figure out how to exert leverage that in a meaningful way resolves the issue There was a period when we cut off all assistance (to Pakistan) and ties and held up F-16s that we were supposed to deliver for a while and that did not help our influence there (in Pakistan). It's a very very tough situation and it may be among the top two or three challenges for the new administration right up there with Syria". #Pakistan Ambassador Makes Case to Stop #India-Sponsored #Terrorism to #UN. Pakistan's foreign ministry says Islamabad has handed over a dossier to the United Nations over the alleged involvement of India in acts of terrorism in the Islamic nation. In a statement, it said Pakistani ambassador Maleeha Lodhi on Friday delivered a set of documents regarding India's alleged role in fomenting terrorism in Pakistan to U.N. Secretary-General Antonio Guterres. The announcement comes months after Pakistan captured an Indian spy, Kulbhushan Jadhav, saying he was behind acts of terrorism in the country. So far, Islamabad has not granted consular access to Jadhav following India's request. Pakistan and India have a history of bitter relations. In recent months they have repeatedly exchanged fire in Kashmir, the border territory divided between them and claimed by both. Dr. Jumma Marri Baloch, a prominent leader of the Baloch independence movement and designer of the separatist flag, recently renounced his decades-long campaign against Pakistan while attending a Pakistani Unity Day event last weekend in Moscow, where Sputnik’s Andrew Korybko had the chance to conduct a brief interview with him. Sputnik: Tell us little about yourself: how and why did you come to Russia, how long have you been here and what do you do presently? Jumma Marri Baloch: I think everybody who was interested about the Baloch affairs might know my struggle to free Balochistan, which is not hidden from anyone. I will not be wrong if I say that I am from those people who were always on the forefront of the Baloch freedom struggle — many of the readers might know the fact that the Free Balochistan flag, which is currently very popular and is in use, was designed by me. For the sake of Free Balochistan I left my home, Pakistan, province, tribe and even my father and brothers. In 1979, due to the Balochistan movement I, along with my family, left for Afghanistan and settled there. Since 2000 I am in self-exile in Moscow. Sputnik: Who is behind the so-called "Free Balochistan" Campaign, what are they aiming for, and how do they operate? Jumma Marri Baloch: There are no doubts that India is squarely behind the unrest in Balochistan. I am a witness to it from within: India tries to counter Pakistan's support for Kashmir and India wants to pay Pakistan in the same coin by supporting a few so-called Baloch leaders who are enjoying very luxurious lifestyles in such expensive cities as Geneva and London. These people are sending some money to create unrest in Balochistan like blowing electricity supplies, mining bridges and putting mines in the roadside to keep the money supplies open from Delhi. Sputnik: What is the reason why some international media have been repeating the claims of Baloch separatists and sometimes even lobbying on their behalf, and how does this relate to global fake news industry? Jumma Marri Baloch: No international media pays any attention to these Baloch separatists except Indian media that are working closely with the Indian intelligence who are paid to cover their paid agents working as Baloch freedom fighters. These are all Indian attempts to silence the voices of the Kashmir struggle for freedom. I guarantee if Pakistan gives even the slightest hint to the Indians that they will stop supporting the Kashmiri, the Hindus will dump the Baloch next day down in a sewage canal. Sputnik: What is the most effective way to debunk these falsehoods and show people the truth about Balochistan and its native people's relationship to the rest of Pakistan? Jumma Marri Baloch: Develop the awareness of people about the negative propaganda, through education and empowering the local people to run their affairs without intervention. The Baloch must be respected, first of all, on their own soil, then such negative propaganda will have no effects. The majority of the Baloch people have no problem with Pakistan, but they have questions to the government as every normal citizen of any country around the world.